I haven't forgotten about you, I promise. It's actually been quite the opposite. I've tried to sit down and write a post many times, but can't seem to find the right words to express how things have been. You haven't been missing out on too much, though. My life has been substantially boring, if I do say so. Don't take this as complaining. I am happy to work. money? abso-freaking-lutely. The social life? not so much. That I will and can complain about. There hasn't been much happening on that front, because apparently, the world has escaped to Florida or anywhere else but here. On to the point of this post. I can't tell you how much online window shopping I've done lately, because if I did, you'd probably laugh your pretty little heads off at me. So, not to give away the embarrassing number of hours I've spent at www.forever21.com, I am just going to show you what it is that I am so eager to spend my hard earned cash on. I have seen these on so many models and fashionistas lately, and am dying to get a pair of over the knee socks. They would be a perfect switch up to my usual leggings and tights, and give me a reason to buy some chunky, strappy wedges. I am in need of shorts too. Thus the reason for my wanting of the popular high waisted short. Perfect for the warmer months? I think so. Did I mention my sheer adoration for any kind of short lace up boot? Well if I haven't, hopefully these Flower Lace-Up Boots will give you a visual. What's on your must-have list these days? high waisted short? They are popular now? I am in love with your must haves! the over the knee socks are such a great idea and i am SO getting some! i need to switch up leggings and tights! and i love high waisted shorts and skirts and love those shoes as well! I love the high waisted shorts... I've been planning to buy one too. 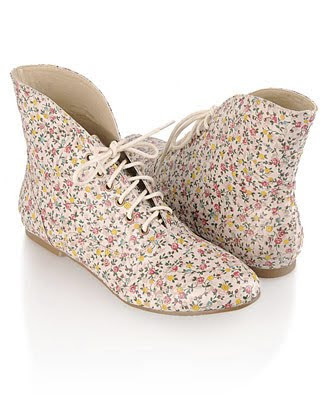 And the floral booties are so cute. Oh, I looooove the high-waisted shorts (and still covet over-the-knees. Just don't know if I've got the legs for it). This is like absolutely crazy...I was just telling my sister last night that I want a pair of the White Floral Doc Martens - the Forever 21 pair you posted look so similar! Love love!